The key to perfect back ribs is to start with bison! Then all you have to do is make sure the ribs are completely sealed while cooking so none of the juice from this special rub escapes. Combine all ingredients into a small saucepan. Note: Glaze can be made in larger batches ahead of time and refrigerated in a sealed container fridge for 2 days. Spice rub can be made in larger batches and kept in a sealed jar at room temperature for up to 6 months. Note: Use dried spices only. Rub spice blend onto both sides of the bison rib racks. Wrap each rack in parchment paper until sealed. Wrap parchment package into tinfoil to completely seal the juices as the ribs cook. Place tin foil packages onto baking sheets and cook at 120°C for 3 ½ to 4 hours. Remove racks from the packages and cut the racks into single bones. 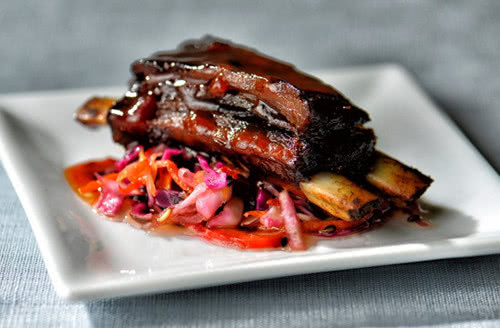 Brush the bones with glaze and finish on the BBQ for 10 minutes to caramelize. © 2018 Carmen Creek All rights reserved. What is our relationship with you? On which topic is your question? Would you like to sign up for our mailing list? You may receive emails about future promotions, recipes, cooking tips, and more.